If you’ve been looking at ways to redecorate the home yourself, you may have heard of dry-lining. It’s the process of attaching plasterboard to a wall, allowing for a smooth finish. A smoother wall means that decorating is made easier, and can start a soon as possible. This method is much easier than re-plastering, and you’re likely to get a better result than if you were to use wet plaster. When dry-lining, it is essential that you wear a dust mask, safety goggles and gloves to ensure the products do not cause harmful irritations. When cutting or sawing metal, protective masks and goggles should be worn at all times – it’s a quick precaution that can save you a lengthy and inconvenient trip to the A&E department. In order to ensure your plasterboard is positioned straight once it’s on the wall, you must mark guidelines on the walls first. This includes measuring out the board widths (working away from the window reveal), as well as allowing for at least an extra 10mm for the adhesive which will be used to fix window sections to the reveal. Next, you’ll need a spirit level to help you mark a vertical line from the ceiling to the floor. This vertical line will serve as a guideline for the first section of plasterboard. Then, carry on along the room marking out lines where the other sections will be. When marking a finish line across the top, allow for at least 12.5mm for the thickness of the plasterboard, as well as 10-15mm for the adhesive. You’ll want your work to look as professional as possible, so it is essential to make neat cuts into the plasterboard. When reaching windowsills, it’s likely you’ll need to cut your plasterboard to shape. To start, make a mark on the wall where the plasterboard sheet will finish. Measure this mark to the windowsill with a tape measure and combination square before taking note of each measurement. Mark these measurements on the plaster board you wish to cut, whilst adding a little extra space so there will be enough room to position it onto the wall. To cut, either use a plasterboard pad saw. These saws are designed to have a pointed, narrow blade which is ideal for awkward shapes and cuts. When fitting the plasterboard, you’ll notice that the adhesive will set incredibly quickly. You can mark on the wall where the applications of adhesive are going to be added to make the process quicker. For walls that are in a poor condition, a timber stud framework can help to even it out once you start applying the plasterboard. You’ll be applying the adhesive to the timber studs instead of the wall, which also allows you to add insulation between the studs and plasterboard – increasing the insulation of your home. When applying the adhesive, use a pointing hawk to add dabs of adhesive. Lift the plasterboard into the correct place, following your markers and use a heavy batten (a piece of timber will do the job) to make sure the board is placed flat against the wall. Check the board with a spirit level, and ensure that it fits snugly against the ceiling of your home. For a neat fit, it’s likely you’ll need to cut your plasterboard to fit snugly within the corners of the room. To ensure this, you’ll need to measure the gap between the wall and the nearest fixed sheet of plasterboard. You’ll then have to cut a sheet of plasterboard 250mm wider than the measured gap, as well as a small piece which is the same width as the gap. 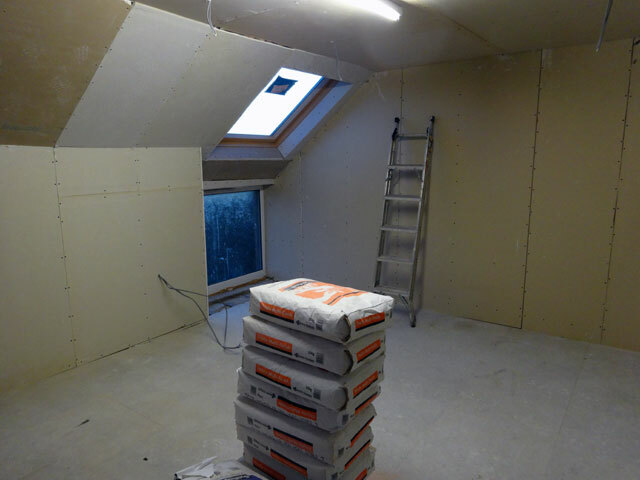 With the wider sheet of plasterboard, place it 200mm away from the corner of the wall. Whilst it’s there, place one end of the smaller piece of plasterboard at the top corner of the wall and the other overlapping the wider sheet. Move the piece down to the floor, tracing the shape onto the wider sheet of plasterboard. Cut along the line you have made to create a plasterboard sheet which fits the corner perfectly. Window recesses will also require you to cut your plasterboard sheets to size. It simply requires you to measure the height and width of the window reveals, and transfer to and cut these measurements from a plasterboard sheet. After applying the cut out pieces to the window recess with adhesive, propping timber supports between the window sill and plasterboard can help to keep everything in place whilst the adhesive dries. To produce a smooth finish on both the internal and external corners of a room as well as the ceiling, a paper-faced metal angle bead with a jointing compound should be used. Measure along the corners (or the top wall for the ceiling), then cut the metal angle bead to fit. Attach the metal angle beads to the wall with a jointing compound before adding a top coat and smoothing over with a trowel. As the name suggests, jointing compound can also be used to create a smooth finish on the joints of plasterboard. Apply jointing tape over the joints before smoothing a layer of jointing compound on top, which can be done using a blade of a coating knife.